He decried "extraordinary" foreign interference in his country's affairs and December's election. Regional leaders have been unsuccessfully trying to persuade Mr Jammeh to hand over power to Adama Barrow, who won the polls. 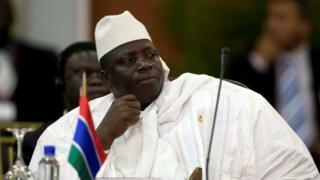 In his televised announcement, Mr Jammeh said "any acts of disobedience to the laws The Gambia, incitement of violence and acts intended to disturb public order and peace" are banned under the state of emergency. He said security forces were instructed to "maintain absolute peace, law and order". It remains unclear if a curfew is being imposed, our correspondent says. There has been an outpouring of grief over the death of Mr Barrow's eight-year-old son - and many Gambians on social media have been changing their profile photos to his image to show their sympathy. Habibu Barrow died in hospital after being bitten by a dog on Sunday at his aunt's house in Fajara, a coastal resort near Banjul. He was mauled by the dog and sustained a head injury. Many residences in Fajara, an upmarket area, have security dogs to ward off intruders. Mr Barrow was unable to attend Monday's funeral as he intends to remain in neighbouring Senegal until his return on Thursday for his swearing-in. But his second wife Sarjo, Habibu's mother, was there along with her two other children. Since Mr Jammeh announced he was contesting the vote on 9 December, Mr Barrow, a devout Muslim with two wives, moved his children to stay with relatives for safety.